Contrary to popular belief, crêpes are not only meant to be enjoyed sweet; savory crêpes are also amazingly delightful! A crêpe is a type of very thin, cooked pancake usually made from wheat flour. 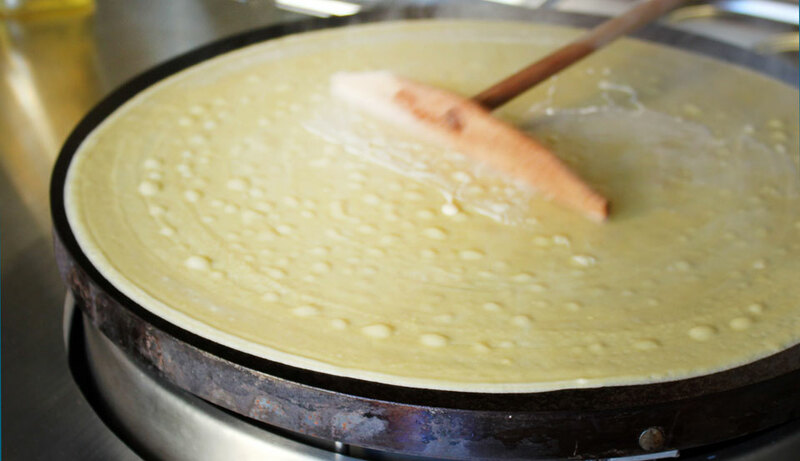 While crêpes originate from Brittany, a region in the northwest of France, their consumption is nowadays widespread in France, Europe and the rest of the world. In Brittany, crêpes are traditionally served with cider. They are made by pouring a thin liquid batter onto a hot frying pan or flat circular hot plate, often with a trace of butter or oil on the pan's surface. Common fillings for meal crêpes include: cheese, ham, spinach, eggs, ratatouille, and various meat products. When they are sweet, they can be a dessert. They can be filled with various other sweet items: jam, melted chocolate, dairy, ice cream, Nutella, bananas, berries, nuts, cinnamon etc. Popular sweet toppings include sugar (granulated or powdered), maple syrup, lemon juice, whipped cream, fruit spreads, sliced soft fruits, etc.